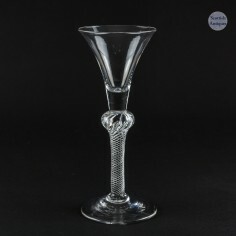 Georgian composite stem wine glasses combine two stem forms one "set in" (above) the other with a knop or collar at the point where the two stem types are adjoined. Thus a single series, air twist section set in a baluster stem becomes a possibility - and a beautiful one at that ! Composite stems always have an air or opaque twist section in combination with a plain stem section, the plain stem section possibly having air tears. 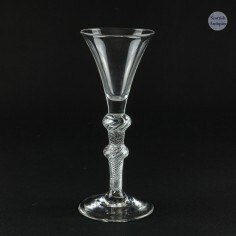 Composites stems in 18th century baluster glasses are both elegant and thus very usable, particularly when the glass has a good-sized drawn trumpet bowl.